Impress your friends and onlookers with an upgraded interior in your 2005-2015 Tacoma truck. While the basic interior is nice, it doesn’t hurt to give your truck a little bit of a spin and spice it up the way you want it to look. You can make it as unique as your personality or you can play it safe and add just enough touches to make others talk about the interior. 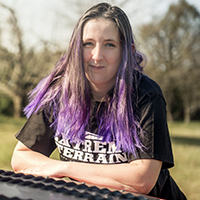 ExtremeTerrain carries many different interior trim options that are designed to fit in with your lifestyle. If you are an off-road fiend, then you will find that some of the more rugged options are better for your truck as you will use the truck often and the interior may need to withstand a bit of abuse from you and your passengers. If you use your truck for work, you may find that there are better options such as a chrome finish on the doors and center console. For those who are after the full package, you will find that your trim options are not limited, and you can choose from a variety of styles. We offer some of the best strip lights that come in different colors and can be cut to match the interior trim you want it to border. No matter what type of upgrade you want to make to your truck, you are bound to find exactly what you want here at ExtremeTerrain. Your Tacoma’s interior is just one step away from being the hottest on the block. Shop our online inventory today and we will ship your products directly to your door.